It’s not often that I toot my own horn. I’m generally modest by nature, and I get a little embarrassed if too much praise is sent my way. Maybe it’s a trait leftover from my childhood, because I was a very insecure child. Always trying to please, never quite sure I was measuring up. Then I was an awkward teenager, who had great skin and not an ounce of excess body fat. But total lack of self-esteem prevented me from appreciating that. But there is one thing that I can say without modesty or pretense: I am really good—fabulous, actually—at procrastination. You may think you are the master, but dear, you are a lightweight compared to me. 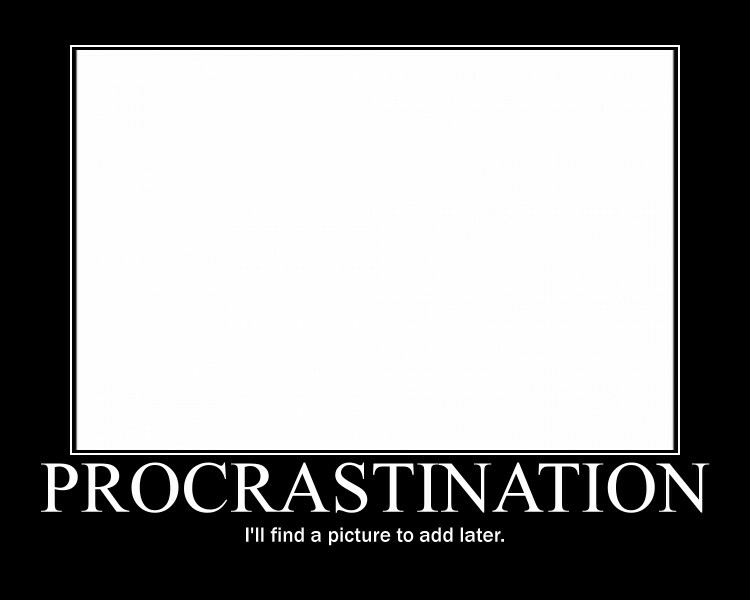 In fact, this post on procrastination has taken me two days to write so far. Because before I can sit down and formulate coherent thoughts, I have to tweet. And pin something on Pinterest. Just now, I vacuumed. I was procrastinating about vacuuming by playing Reversi on my phone. Oh, sorry, saw a cute squirrel outside my window. Anyway, where was I? Oh yes… I’m a master of procrastination. I’ve learned to accept it. But let’s face reality for a moment—I’m a mother of four, a wife of a military man, a writer, a school volunteer, Brownie troop leader, MOMS group leader, and I have a part-time non-writing job. I just don’t have TIME to procrastinate. At the end of the day, as I’m laying in bed, reading instead of going to sleep (yes, I even procrastinate there), I’ll think about all the things I didn’t get done earlier and how long my to-do list is the next day. All because I procrastinate. This year is a year of changes for me. I’m intent on changing many aspects of my life, at least that which I have control of. Time management is a big thing for me. (Eliminating clutter, adopting healthier eating habits, exercising more, praying more, and smiling more/yelling less are just a few other things.) If I were more efficient, I could probably eliminate much of the stress that gnaws at me. No worries about impending deadlines or unfinished work looming over me. More “free” time to work on that “smiling more/yelling less” goal. 2. Baby steps. It’s just too overwhelming to look at a to-do list as long as your arm. By breaking the tasks down into baby steps, I can do a little here and a little there. It may still take me a while to get something done, but at least it’s getting done! 3. Change of scenery. I procrastinate best when I should be writing, because sometimes it is just hard to get my creative juices flowing. Instead of chaining myself to the desk until I write, I think I will take a break and go get some fresh air. Or hit the grocery store and knock off one of the things on my to-do list. Sure, I’m still procrastinating, but sometimes you just need that change of pace to re-focus you. Meanwhile, if you have some tried and true tips for avoiding the procrastination trap, leave them in the comments below! You know, when you get around to it. « Welcome to the Family Room!